Sweet potatoes, also called yams, are a healthy and tasty treat. Sweet potato pie! Sweet potato fries sprinkled with cinnamon and dipped in mustard! Baked sweet potatoes with a little butter and brown sugar! Mmmmm! 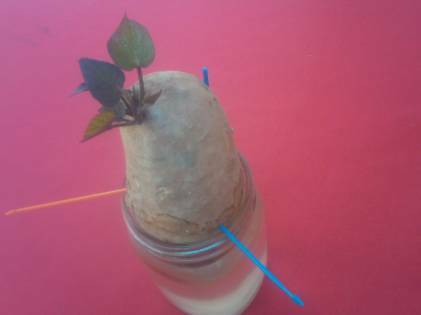 You don't need seeds to grow sweet potatoes - you can start your own from a "mother" plant. 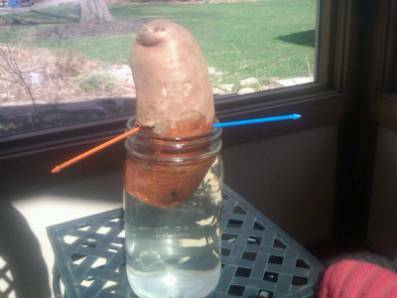 Since sweet potatoes grow best when it's getting hot out, do this in mid-April so that about four or five weeks later, in mid-May, when daytime temperatures are getting warmer, you'll have lots of baby plants ready to plant outside. You might get more sprouts if you use a home-grown sweet potato from the year before. If you didn't grow them and store them the year before, you can buy sweet potatoes at many Farmers Markets. Why? Because many sweet potatoes offered for sale at grocery stores have been sprayed with a safe and totally edible chemical intended to keep them from sprouting while in storage. While store-bought sweet potatoes still will sprout for you with this method, you probably will get more sprouts from a home-grown variety. Here's one just started . . . toothpicks hold the tater in place. Each sweet potato makes about 6-8 baby plants this way, and you plant them 18 inches away from all other plants. If you don't have a lot of garden space, you'd better do this with just one potato . . . or you'll be OVERRUN WITH VINES!!! AAAIIIEEE!!! 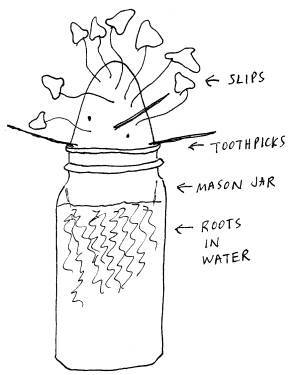 Simply fill water almost to the top of a Mason jar (clear glass canning jar). If you're using a small sweet potato, use a pint-size jar. If it's a big "honker," use a quart-size jar. Cut the sweet potato in half. You can either eat the other half, or get two jars and double up, putting one end in each container. Stick toothpicks near the cut edge of the sweet potato half so that the surface of the sweet potato is under water. About one-fourth of the sweet potato should be under water, and three-fourths above water. Set the jar or jars on a sunny windowsill in a warm room. That's it! Now have fun watching or the little shoots rise. It may take about two weeks for them to appear, and another two weeks for them to grow very long. Be patient. When they are about 6 inches long (use a ruler to measure! ), gently twist them away from the potato. Don't worry that there are no roots for these slips - that's what Phase II is all about. Lay the 6-inch shoots sideways into a shallow container of water so that only their bottom halves are immersed. The top halves can lean over the side of the bowl. A few days later, you should see roots begin to grow. When they are an inch long, it's time to plant outside! Go online for instructions on caring for sweet potatoes, and look forward to a bumper crop of 8-10 sweeeeeeeeet treats per plant.